Filip Hrgović (5-0, 4 KOs) will box at home for the first time as a professional on September 8 as he headlines an action-packed fight night at the Arena Zagreb. The Croatian boxing sensation has taken the heavyweight division by storm since joining the professional ranks on September 30, 2017. Starting in style, he needed just 90 seconds to dispatch Raphael Zumbano on his paid debut at the Riga Arena in Latvia. Victories over Pavel Sour (KO1), Tom Little (TKO4), Sean Turner (UD8) and Filiberto Tovar (TKO4) have followed, and after only five professional bouts, Hrgović is currently ranked number 37 in the world by independent statistics site BoxRec. Having fought all his previous contests away from home, the Rio 2016 Olympic Bronze Medallist says he is delighted to be fighting in Croatia, and has vowed to make his countrymen proud with his greatest performance yet. “It will be a special moment when I walk out in front of my home fans at the Arena Zagreb,” says Hrgović. “It is a huge opportunity to box as the main event in your hometown. It will give me a lot of confidence and pride but also a lot of responsibility to place Zagreb on the world boxing map. An opponent for Hrgović’s homecoming will be announced shortly with his promoter targeting a top 50 heavyweight and a title fight for the dynamite-fisted 26 year-old, who says he is ready and willing to face anyone. “I am currently ranked 37 in the world after 5 fights,” he says. “This has never been achieved before by any heavyweight. So as you can see, I am on a fast track, and I will take any opponent. As I keep saying, if you want to be World Champion, you must be ready to fight the best. 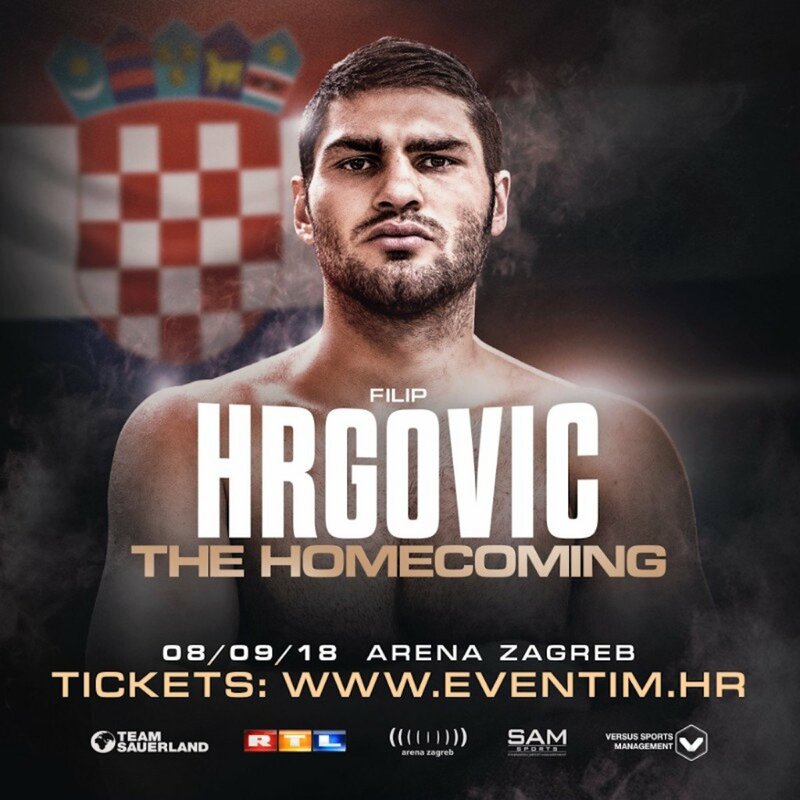 As he awaits news of his opponent, Hrgović urges the Croatian public to join him on September 8 for what he promises to be ‘a great night of boxing’ in Zagreb. Tickets for the Zagreb Fight Night on September 8 featuring Filip Hrgović’s hotly anticipated homecoming fight start at 110 KN and are available online via www.eventim.hr.